Clinical trials have shown that survival rates appear to be similar for patients with early-stage breast cancer who are treated with breast-conserving surgery and radiation or with mastectomy. “However, recent studies have indicated that the use of mastectomy is increasing, particularly bilateral mastectomy, among women in the United States with breast cancer,” says Allison W. Kurian, MD, MSc. Typically, bilateral mastectomy is considered both a treatment for the affected breast and a prevention measure for the contralateral breast. Bilateral mastectomy is increasingly being used to treat unilateral breast cancer despite the absence of evidence showing that it offers a survival benefit to the average woman with breast cancer. Bilateral mastectomy has been shown to be an effective secondary prevention strategy for high-risk women with BRCA1/2 mutations, but the procedure may also have detrimental effects. These include higher risks for complications, increased costs, and a negative impact on body image and sexual function. “We need a better understanding of the use of bilateral mastectomy and outcomes associated with its use to improve cancer care,” Dr. Kurian says. In a study published in JAMA, Dr. Kurian, Scarlett Gomez, PhD, and colleagues compared the use of bilateral mastectomy, breast-conserving therapy (lumpectomy) with radiation, and unilateral mastectomy and the mortality associated with these procedures. The goals were to determine if there were particular types of patients who were likely to receive a bilateral mastectomy and find out if there were relative differences in mortality among the three procedures. “We could address these questions because we used data from the California Cancer Registry, which covers almost all women diagnosed with breast cancer in the state,” says Dr. Kurian. The registry also features information on factors that can influence treatment decisions, including socioeconomic and health insurance status as well as where patients received care. The study consisted of nearly 190,000 breast cancer patients in California who were diagnosed with cancer in one breast between 1998 and 2011. According to the results, the rate of bilateral mastectomy increased from 2.0% in 1998 to 12.3% in 2011, representing an annual increase of 14.3%. Among women younger than 40 years of age, the rate increased from 3.6% in 1998 to 33.0% in 2011. “These increases occurred despite uncertainty as to whether bilateral mastectomy was any better than the alternatives,” Dr. Kurian says. In addition, a mastectomy can require significant recovery time and may entail breast reconstruction, whereas other procedures like lumpectomy are much less invasive and have shorter recovery periods. “The average breast cancer patient who underwent bilateral mastectomy had no better survival than those who had lumpectomy radiation,” Dr. Kurian says (Table). The study did find, however, a slightly lower survival rate among women who underwent a unilateral mastectomy. 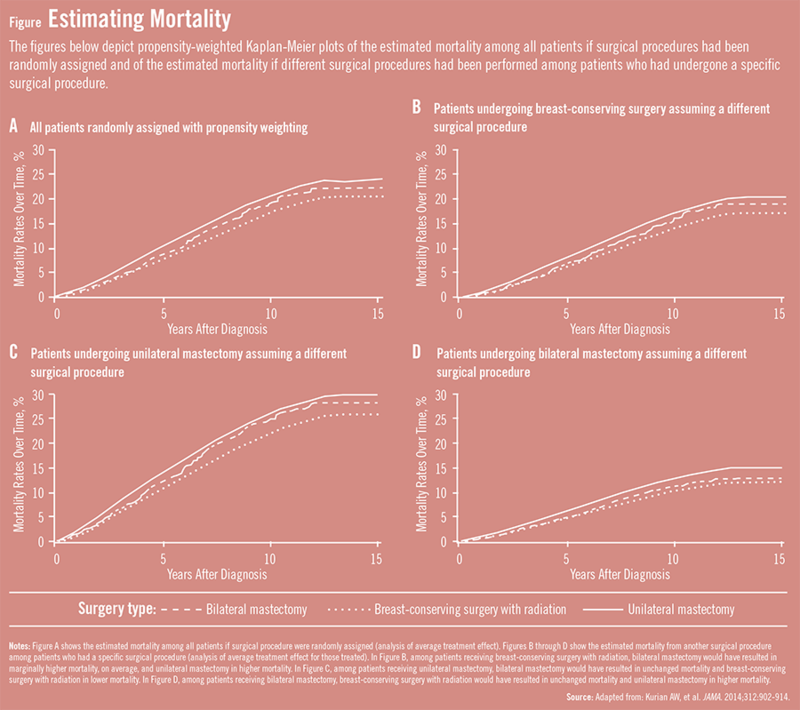 The researchers also estimated the 10-year mortality rates among all patients if surgical procedures were randomly assigned (Figure). The estimated 10-year mortality rates were 18.8% for bilateral mastectomy, 16.8% for breast-conserving surgery with radiation, and 20.1% for unilateral mastectomy. Racial and ethnic minorities and women with a lower socioeconomic status were more likely than others to receive a unilateral mastectomy. Conversely, women who received a bilateral mastectomy were more likely to be middle- or upper-class, younger than age 50, Caucasian, or some combination of these factors. According to Dr. Kurian, the slightly lower survival rate among women receiving unilateral mastectomy could be the result of these patients having less access to care, language barriers, or that they are in a lower socioeconomic category. These patients may also have been more likely to have other chronic health problems that could adversely affect the course or effectiveness of cancer treatment. Kurian AW, Lichtensztajn DY, Keegan THM, Nelson DO, Clarke CA, Gomez SL. 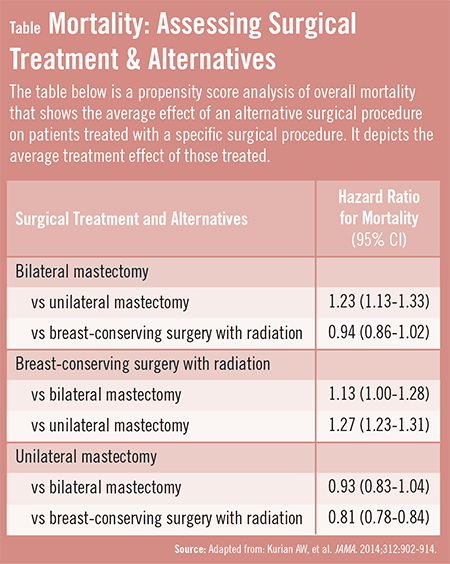 Use of and mortality after bilateral mastectomy compared with other surgical treatments for breast cancer in California, 1998-2011. JAMA. 2014;312:902-914. Available at: http://jama.jamanetwork.com/article.aspx?articleid=1900512. Gomez SL, Lichtensztajn D, Kurian AW, et al. Increasing mastectomy rates for early-stage breast cancer? J Clin Oncol. 2010;28:e155-e157. King TA, Sakr R, Patil S, et al. Clinical management factors contribute to the decision for contralateral prophylactic mastectomy. J Clin Oncol. 2011;29:2158-2164. Kurian AW, Mitani A, Desai M, et al. Breast cancer treatment across health care systems. Cancer. 2014;120:103-111. Schnipper LE, Smith TJ, Raghavan D, et al. American Society of Clinical Oncology identifies five key opportunities to improve care and reduce costs. J Clin Oncol. 2012;30(14):1715-1724. Allison W. Kurian, MD, MSc, has indicated to Physician’s Weekly that she has received grants/research aid from Invitae and Myriad Genetics.